The desert doesn't have to be desolate. The views up in the Schnebly Hill Road area are some of the most stunning anywhere on earth. Pale-skinned bikers from winter's frozen north migrate south to Sedona to thaw their bones and ride without three layers of damp-proofing. 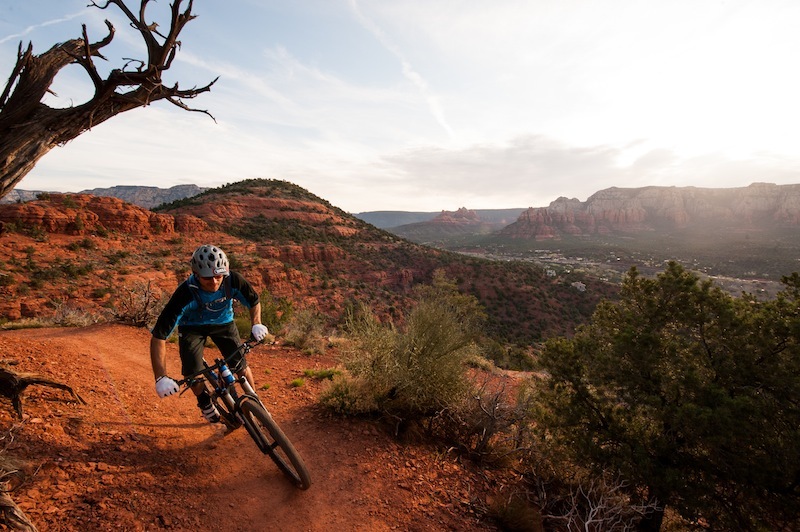 Riders looking for the next hit of adrenaline, serotonin, and vitamin D come to the Sedona healing sanctuary. 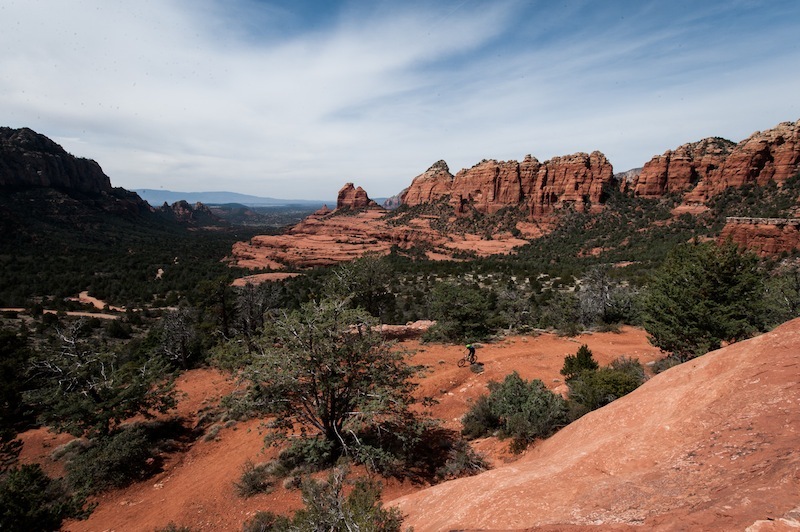 However, most ignore the crystal cults and cosmic gems that Sedona is widely known for, and instead go straight to the trails for their therapeutic tonic. Sedona's secret is out. Jason First left his job and home in Laguna Beach, California, to set up the Over The Edge Sedona bike store two years ago and even in that time has seen a considerable increase in the number of riders rolling into town. Before moving to Sedona he recognized the rising potential it had. Sedona represented the kind of community he wanted to be a part of. 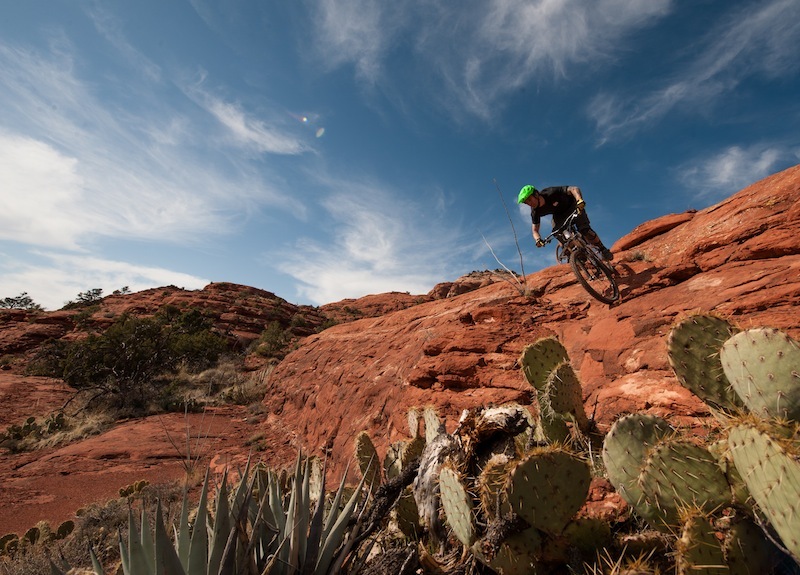 Being a diehard mountain biker he was attracted to Sedona for the same reasons that so many other bikers are discovering. “Why are people coming here?” First ponders the question. “The easy access to the trails, it's relative proximity to other riding areas, and the year round riding. It's warm when a lot of other places are icy cold, even Moab. Who doesn't like that?" "The Forest Service has integrated the mountain bike community into the resolution process and they now understand the needs of mountain bikers. The Forest Service has been active in consolidating trails, so a few trails have been decommissioned, but ultimately the overall network benefits. We now have a trail map and signage; this helps both visitors and locals." The backyard scene of Over The Edge shop is worth a stop. Relaxing beers and burgers, washed down with a lap on the pumptrack. This makes it not only a shop, but a community cornerstone. "The recent "cull" of a few trails is not so bad. Especially as some of the better stuff has been adopted. Illegally-built trails like Hangover Trail have now been included into the trail system. Environmental assessments have been completed, signed off on, mapped, and public liability has been considered." Some of the locals are a little prickly towards the recent collaboration between the VVCC and the Forest Service. Why? Maybe because it could be a mind controlling chem trail plot by the aliens, funded for by the government. 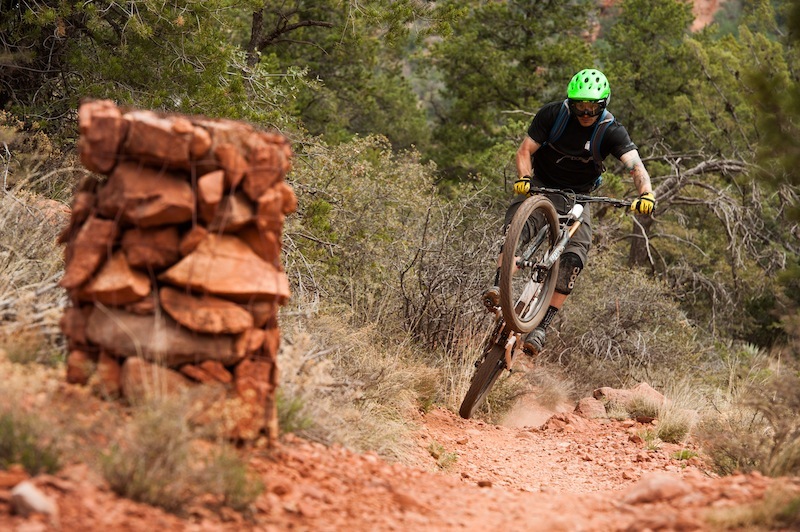 "The Forest Service has embraced mountain biking at last. For years it was like beating my head against the wall. Trails were built, then closed, then built again, then closed. But when Jennifer Burns became the new Recreation officer and the powers that be saw the growing number of riders coming here and that trails were being built illegally regardless of what was happening, they started to encourage people to build sustainably, to the right standards and within the system." The vortex by the airport gives riders a significant sense of composure and vibrancy. The VVCC have been extremely active in getting things to where they are. 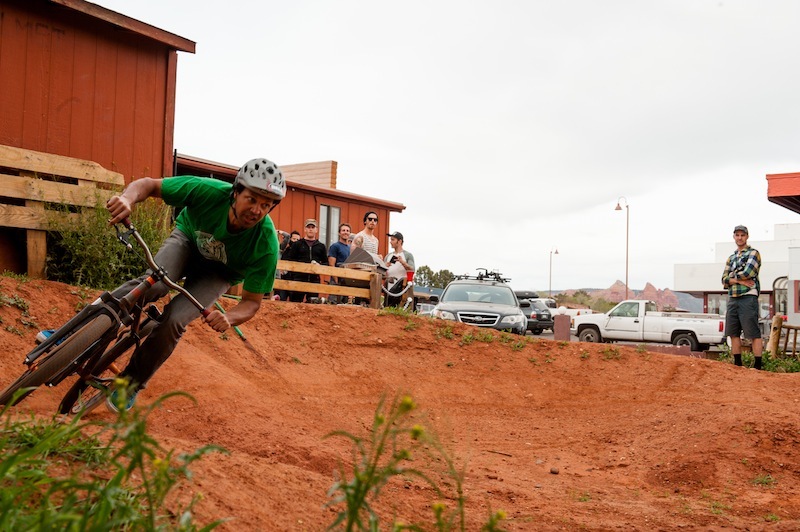 They negotiated and cooperated with the Forest Service, organized trail maintenance days, and presented mountain bikers in a more positive light. Despite the positive moves of the Forest Service and the local cycling community there are still a small number of riders who harbor a deep fear of any official and governmental organization. Sedona has more than its fair share of conspiracy theorists – chem trail believers, UFO trackers, and many with a suspicion and mistrust of the government. Lars suspects there are some mountain bikers in the local community who are caught up in the same sort of paranoid rhetoric. "Some people are sensationalizing the closure,” explains Romig. “Some people are paranoid and say that the situation is way worse than it is. Yes, some trails have been closed but it is a case of give and take. Some trails are closed but others are adopted and legitimate now; secured for mountain bikers. However, there is still a small minority of riders who are distributing propaganda that is just scare mongering. They think that this is a token gesture by government and that they [the government] really want to shut down mountain biking in the area and this is their way of doing so." It seems slightly strange that there are riders that believe such positive moves by governmental agencies – the power structures that do have the potential to utterly shut down mountain biking in the area – are actually a grand plot to eradicate mountain biking. This, surely, is a watershed moment for mountain biking, where it is accepted and integrated into the land use management plans. The trails are still there and they are very good. Perhaps the alarmists just want to keep the trails to themselves, and continue to live as cowboy trail builders and rogue riders, rather than accepting that such an outlook is unsustainable now that the horse has bolted. That way of thinking. Lars believes, is way behind the times. "The word is out,” Romig says. “The tipping point is passed now, and people are talking. It is not just total insider and core riders that know about a little hidden gem." With great trails come great responsibility. Some people say there are vortices in Sedona, places where there is a discernible magnification of energy. They come to these places with their tools of divination to get closer to the supernatural bliss. Usually these apparatus are magic stones, prayer mats and a strong desire to believe. 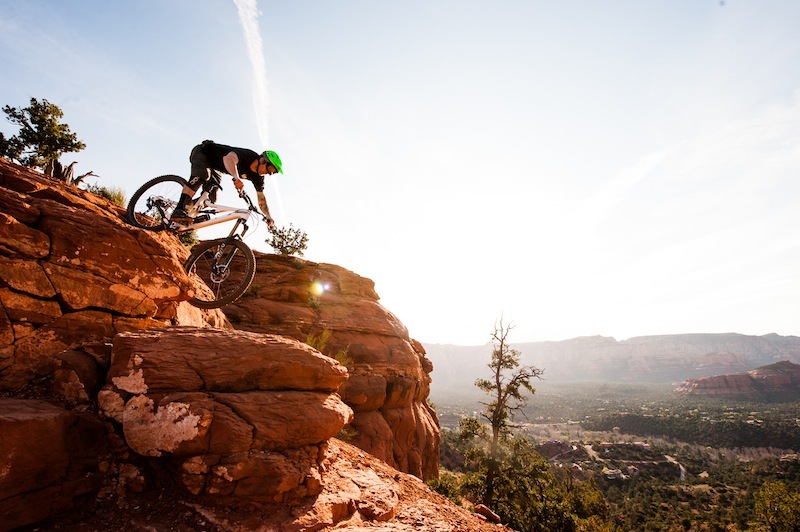 However, it could be argued it’s far more likely that the mountain bikers who explore Sedona are perceptibly closer to receiving a glimpse of celestial enlightenment and divine happiness, simply through their practice of sweating, shredding and immersing themselves in Sedona’s back country. Who thought marking timecodes could be so funny? Well, we did it seems. How Does Yeti's New 650b Model Stack Up Against Its 'Super Bike' Siblings? Why Was This Burly Brawler Such A Polarizing Bike Among Our Testers? Does this 27.5-inch-wheeled XC whip live up to its promise? There's a lot of hype about the Ripley. Did our testers believe it? Or not?